For my breakfast toast I like my jam chunky and fruity, thick, with skin, seeds and everything. I’ve never been a big fan of jellies, it’s like something is missing, I need to feel those crunchy bites. Even blackberries, red or black currants, I always cook the whole fruit. 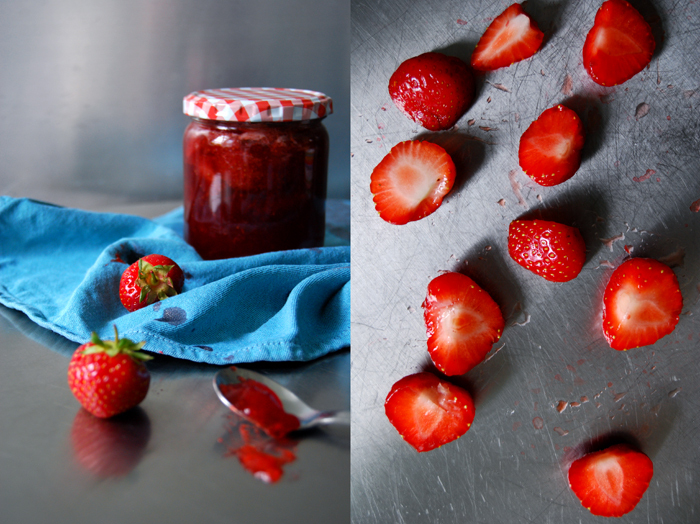 When it comes to my favourite spread, sweet strawberries, I cut the fruit in half, it makes a very chunky jam, you can still taste and feel the berries. 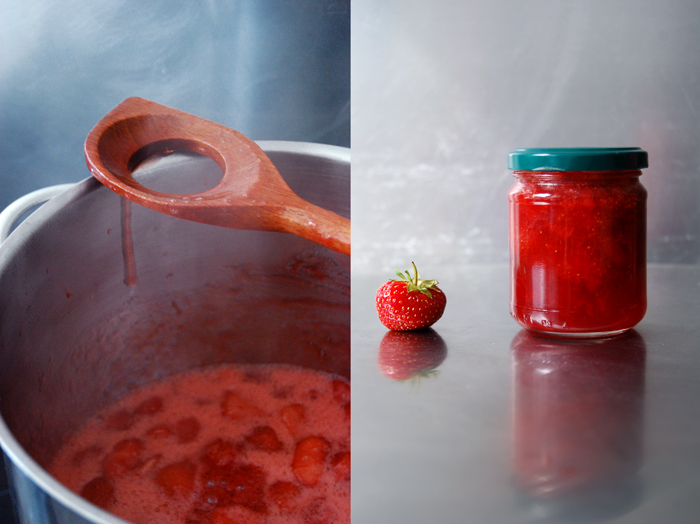 In my family, we have always used jam sugar (also known as gelling or jelly sugar) when we make strawberry jam. It contains pectin made of apples and citrus fruits and you can also choose between three different types, either 3:1, 2:1 or 1:1. The numbers stand for the ratio between fruit and sugar, I prefer 2:1 which allows a less sweet jam, you only need 1 pound of sugar for 2 pounds of berries. I cook mine for 4 minutes to turn it into a concentrated fruit spread, I don’t even need to test for the setting point. It works perfectly! 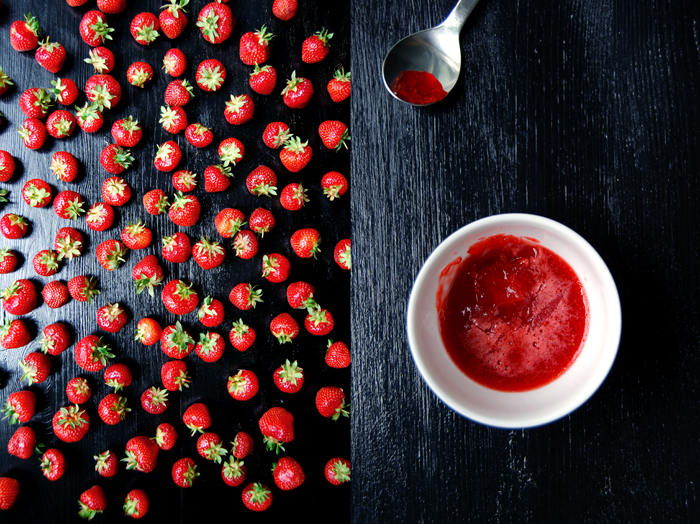 Since I was a child, I’ve always loved to cook jams. It was exciting, all those fruits to prepare, my mother would bring out her special tall jam pot and the long wooden spoon, both only came to use when it was jam time! The process of sterilizing the jars in boiling water and spirit felt like a science project to me. 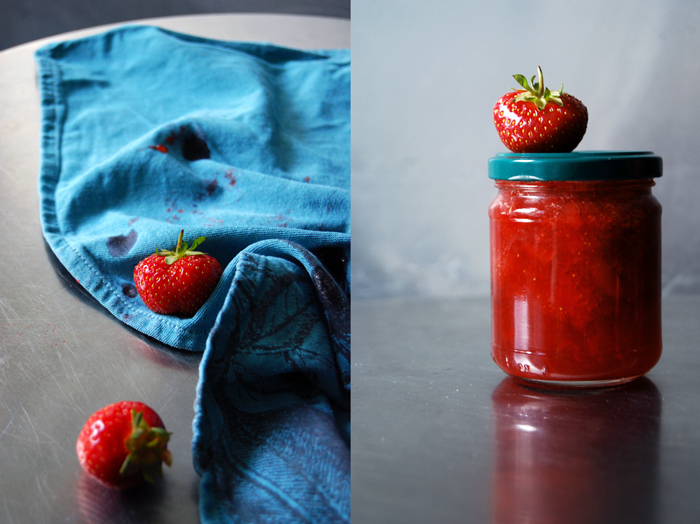 From my mother I also learnt to cover the jam in the jar with a circle cut out from thick plastic foil dunked in alcohol. It prevents the jam from molding and keeps it fresh for years! Sterilize the jars and lids in boiling water for 5 minutes. Dunk the rims of the jars in spirit and wash out the lids and the ladle (you will use to fill the jars) with the alcohol. If you can get a thick foil (thicker than cling film), cut out 8 circles roughly the size of the jars and put into the spirit as well. Put the fruits and sugar in a pot and bring to the boil, stirring with a long wooden spoon every now and then. When the boiling point is reached (you should see quite a few bubbles coming up), let the jam boil for 4 minutes, carefully stirring a couple times (without burning your hand, hence the long spoon!). Take the pot of the heat and fill the prepared jars with the sterilized ladle almost to the top. Cover with the circles of foil and close tightly immediately. 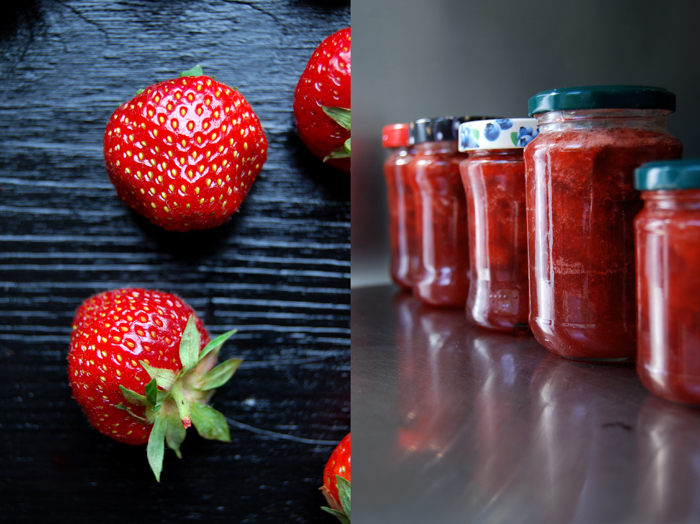 Let the jam sit for 1 day before you spread it on your first morning toast and store the jars in your pantry.